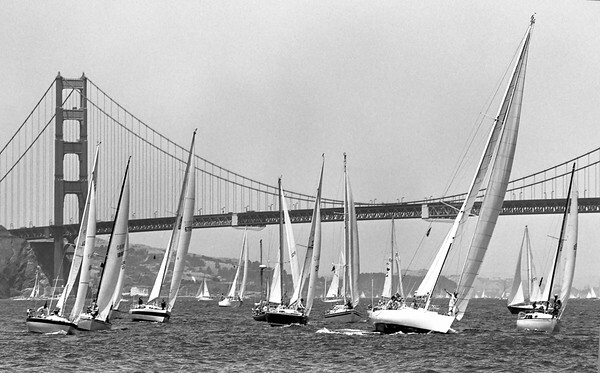 Ocean racing between California and Hawaii has a long and storied history. This exciting and beautiful passage has been luring intrepid racers for over a century. Although the Pacific Cup is the youngest member of an elite club of races — it celebrates 36 years next summer — it is certainly not the least challenging. Initially billed as the Kauai Race, it has remained true to its founding principals to be a fun yet competitive race. Taking a look back, it’s interesting to see what it was like to compete in the first race, well before the age of Spectra, 3DL sails, carbon fiber, satellite telephones and racer trackers. 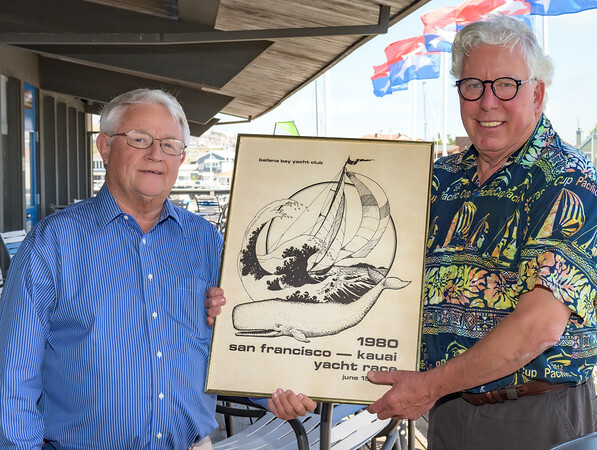 It all began back in 1979 when Hal Nelson brought up the idea with Ballena Bay Yacht Club’s commodore Vytas Pazemenas. The Single-handed Transpac’s inaugural race from San Francisco to Kauai took place just a year before and Nelson, along with a group of enthusiastic sailors, thought it would be fun to do a similar crossing with crewed boats. They’d selected the Nawiliwili Yacht Club on the southeast corner of Kauai as the destination and a small group of rugged volunteers in Hawaii arranged for the finish. Months later after many had questioned the viability of such a race (there were already a number of offshore races taking place), racers started signing up. Eventually over 70 skippers had expressed interest in racing to Kauai. But what put the race on the map was the entry of Bill Lee’s famed 67-footer, Merlin, skippered by Norton Smith. On June 15, 1980, 40 boats crossed the starting line proving that Nelson and his visionaries had created something with the potential to endure. Fast-forward seven years and the race had outgrown both the Ballena Bay Yacht Club and the facilities at the Nawiliwili Yacht Club. George Barrett then spearheaded the formal creation of the Pacific Cup Yacht Club in 1987. A search was done for a new finish line in Hawaii and soon a strong working relationship was developed with the Kaneohe Yacht Club on Oahu. To this day, the Kaneohe Yacht Club remains a steadfast partner of the Pacific Cup Yacht Club and provides one of the most beautiful finish lines the world over. It’s particularly interesting to hear about the first Pacific Cup from some of those who raced it in 1980. Their experiences highlight the Pacific Cup’s humble beginnings and also make clear that even today participants face many of the same challenges crossing the Pacific Ocean as they did years ago. John Tysell entered his Cal 3-30 Soufriere in the inaugural race, placing a respectable 2nd in Division V. “We were racing in the ocean and one of my crew asked if I’d heard about the race to Hawaii,” Tysell recalls. “We’d been doing a lot of ocean racing and it sounded like fun.” Tysell and crew were invited to at least three pre-race socials as well as weather and safety briefings. Beyond that, race organizers had developed a detailed and complex support infrastructure for the race, which paid off then, and in future years. Dean and Pamela Treadway, Transpac veterans and longtime owners of the well-known Farr one-ton Sweet Okole raced that first year as well and won their division. “We did the race again in 2006, 2008, 2010 and 2014. In 2010 we won our division and also won the Best Performance Trophy. Sail maker (and fellow Farr one-ton owner) David Hodges was on the boat that year. In 2014 we were well in the lead and set to win without a doubt, but our rudder broke 140 miles from the finish and we had a DNF,” recall the Treadways. Equipment failure wasn’t the only serious challenge encountered. “About halfway across,” Tysell recalls, “a Santana 35 called Friendship had a medical emergency.” Apparently the skipper was throwing all kinds of equipment overboard and the crew couldn’t understand why — they thought he might be going through DTs, so they tied him up. “As a physician, I was talking to the medical officer on board a nearby New Zealand navy ship and we determined that the skipper had gone off his medications — a very serious development that reiterates how important it is to know your crews’ medical conditions and ensure that they continue their medications. One of the finest moments of the Pacific Cup, of course, is the finish. This is a special moment for each and every ocean racer, and every one has his or her particular memory associated with their finish. A close friend greeted Tysell on the Nawiliwili Yacht Club’s lawn. He offered Tysell a fresh piece of steak — which he was holding in his hand — and hot showers for the crew. That’s a winning combination. Perhaps it is the idea of finishing a race in one of the most beautiful places on earth that keeps sailors racing to Hawaii — and the competitive yet fun spirit that draws them to the Pacific Cup. But there’s a good chance it’s the thrill of surfing down waves in 20-30 knots of breeze and seeing the islands in the distance. Regardless, the pure beauty of Hawaii remains steadfast, just as it was in 1980, luring eager sailors from near and far, and knowing there’s a cold Mai Tai waiting for them at the always welcoming Kaneohe Yacht Club.